I’m still experimenting with PSK and this is a quick snapshot of the setup I was playing with today. Again, cheap and quick and dirty, using stuff I already had in the house; my Macbook and the USB microphone adaptor plugged into the Kenwood. This system works a lot better than the iPad version did for several reasons. First, the audio output quality of the laptop is better, allowing me to turn on the radio’s VOX system so it transmits automatically when I want to send something. Second, the Macbook is much, much more powerful, and the software’s level of sophistication reflects that. I’m running Fldigi on the Macbook and it works quite well indeed. All of the iPad apps I’ve seen are limited to working with a single type of digital communication; RTTY, PSK, CW, etc. Fldigi works with all of them. Plus it includes an enormous number of bells and whistles, like built in logging capabilities and, if you have the right interface, even control of the radio right from the program itself. Unlike the iPad software I was running, Fldigi doesn’t just decode the selected stream in the waterfall, it decodes all of them, at the same time. In the screen image above, it’s simultaneously decoding four separate transmissions at the same time. The question, of course, is does it work? And the answer is yes, even with the cobbled together setup I’m using here. In the short time I was playing around with it, I made two contacts, one in Oregon, the other in California. And that was with my transmit power dialed down to 25 watts, and feeding my Comet vertical antenna, which some people claim is little more than an over priced dummy load. Once I get the actual interface between the computer and radio up and running, this could get real interesting. So I’m a grouchy farmer so why all this stuff about amateur radio? Because we still have snowbanks 4 feet high around here despite warming temperatures, so I mess with radio stuff. I’ve been using an iPad app called PSKer which works far better than it has any right to. It ‘hears’ the PSK31 tones from the radio and decodes them, and when you type something in, it sends the PSK tones out the speaker. But background noise is an issue. I am now using Apple’s camera adaptor with the USB connector on it, with a USB microphone adaptor plugged into that. The output from the speaker on the radio goes into that, and bingo, a nice, clean display without any hash from background noise. Unfortunately I still haven’t got things set up for transmit, hence the microphone aimed at the iPad’s speaker. It works. Sort of. But just having a truck roll by outside can cause havoc. I need to get the output from the adaptor into the microphone inputs on the radio, and hopefully figure out how to trigger the PTT circuits at the same time, or perhaps use the radio’s VOX capabilities to deal with triggering transmit. This will give you an idea of what you can do with little or no money, though. Except for the Kenwood, everything else was stuff I had laying around the house already; iPad, camera adaptor, USB mic adaptor, etc. The only thing I actually had to buy was the PSKer software, and that was all of about $3. 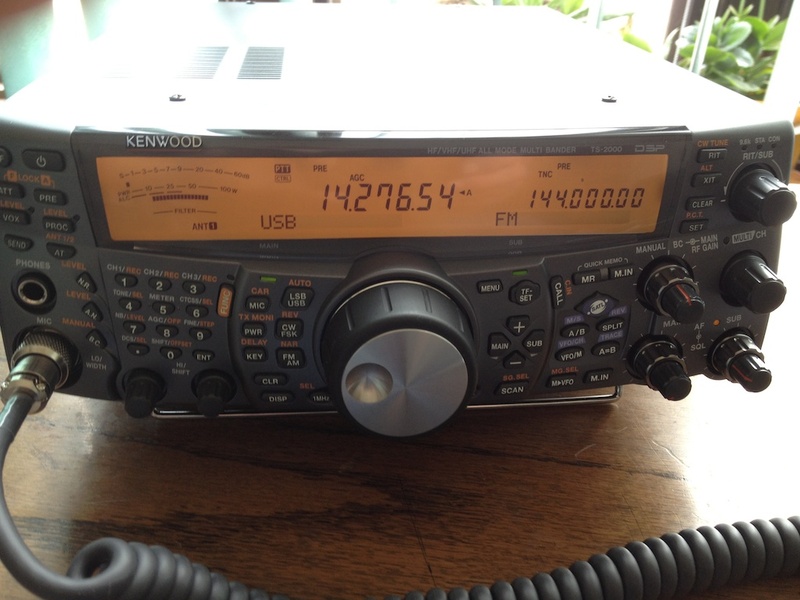 I’m new to amateur radio. Just got my license in February when I passed my Tech and General tests. So a lot of this stuff is still new to me and I still find it a bit amazing, like this set-up. This is an ordinary iPad running a program called PSKer, available on the App Store. Using no additional hardware at all, just the iPad, with it’s internal microphone and speakers, it will decode and send text in PSK31. Now I’ve been working with computers, radios and electronics for ages, but sometimes modern technology still surprises me. I haven’t tried transmitting with it yet. That’s a bit awkward, but decoding works pretty well, although you do need a very clear signal with little or no interference, which is sometimes hard to do. And look at that nifty waterfall display! Heck, it was worth the $3 just for that! I wanted to talk a bit about the Kenwood TS-2000 now that I’ve spent a couple of weeks actually using it. This isn’t a formal review, you’ll find enough of those out on the net, along with specifications and all that other fun stuff. I want to talk about what it’s like to actually use it, something that gets lost in the mix in formal reviews. The 2000 is an impressive piece of equipment straight out of the box. I’m used to consumer grade electronics which are generally so badly made that it’s lucky if they survive being unpacked. The build quality of the 2000 is so far beyond what I’m used to that I am still impressed by it. The knobs and keys are rock solid. The knobs are silky smooth in action, with no side play at all. The keys are extremely well fitted and solid as well, with positive tactile feedback. Everything about this radio is extremely well made with tight tolerances, with excellent attention to detail. The display is reasonably well laid out, if a bit cramped. It’s generally easy to read, although a bit intimidating and confusing at first as all of the different functions come into play. Fortunately the manual has several pages devoted to just explaining what in the world pops up on the display. Although a bit confusing at first, it doesn’t take long to get used to. There is an SWR meter built into the unit, but you can’t see it here. It appears over on the left side of the display with the other meters and seems to only appear when you hit the button to activate the internal antenna tuner (yes, it has a built in antenna tuner). Unless I’m missing something (which I admit is entirely possible), the SWR meter appears only at that time, and is only active during the actual process of tuning for the antenna. Considering that this takes all of about 2 seconds, during which time the meter jumps around all over the place as the unit works on acquiring the best SWR reading for the antenna, you’d better keep an eye on that thing when you hit the antenna tuner button or you’re going to miss it. By the way, the antenna tuner and SWR meter only work on HF. Once I got used to the control configuration, the radio isn’t hard to use. It can be a bit intimidating, though, because all of the keys have multiple functions. A quick press does one thing. Press the key and hold it down, and it activates yet another function. Press the FUNC button, and the keys now activate an entire different group of functions. It may seem confusing at first, but I got used to it quickly, although I found it necessary to keep the manual handy. But once I started to use it seriously, everything started to make sense with control groups laid out in a logical fashion. There are 2 HF antenna connectors on the back and 1 VHF, both 259 style connectors for standard coax. The UHF antenna is an N style connector (which means that to use UHF I’m either going to have to get a separate UHF antenna or cobble together adaptors to feed my multi-band VHF/UHF antenna). There is also an antenna jack for HF receive only if you want to go that route. (There is a lot of other stuff back there that I’m ignoring because I don’t use any of it, except for the CW key jack). On the VHF side the transceiver is being fed with a Comet VHF/UHF vertical antenna that seems to work pretty well. On HF it’s hooked to a Comet 250B vertical because a) I’m really lazy and the 250 is real easy to put up, and b) it’s the middle of winter and trying to put up complex antenna systems with 3 feet of snow on the ground and -10 wind chills is no fun at all. Actually using the 2000 is pretty straightforward, with no glitches or nasty surprises. Everything works exactly the way it’s supposed to and I’ve had a lot of fun with it. I did replace the included hand held mobile mike with a desktop model. There are some minor irritations, like the numeric keypad. I find the buttons too small for my short, stubby farmer fingers. I also question why I have to press the ENTer button before I can enter a frequency directly. I understand the need to have multiple functions for keys, but the thing most users are going to use that numeric keypad for is entering frequencies (or at least that’s the case with me), not using the functions associated with the keys. But the ENT button has to be pressed first or you’ll end up selecting various functions you don’t want. Even after having used the radio for a couple of weeks I still find myself trying to punch in frequencies without hitting that blasted ENT button first. Having the dual receivers is fantastic. It lets me monitor my favorite repeater frequencies up on VHF while I work on HF on the other side. In the photo you can see that the main receiver on the left is down on 14.27 mHz while the sub receiver is on 144 mHz. Since the photo was taken, I’ve programmed the memories in the radio with a dozen or so of the repeaters I use on a regular basis, and generally I keep the ‘B’ receiver on the left scanning those frequencies for activity while I’m down on HF with the main receiver. If I hear someone I want to talk to on VHF I just hit the ‘SUB’ button to the right of the main tuning dial to transfer the transmit functions over to the sub-receiver and away I go. VHF-wise, the radio has been fantastic. Even with transmit power dialed down I can hit the local repeaters with no trouble at all. On HF the results have been mixed. Not because of the 2000, but because of the antenna I’m using. I’m not going to go into detail about the drawbacks of a multi-band HF vertical antenna because you can read those anywhere. Let’s just say that the Comet 250 isn’t the most efficient antenna in the world and leave it at that. At best it is a compromise for someone like me who wants to get on the air on HF fast and easy.